Melissa McGrath provides operational support, guidance and leadership to our hospitals in central Alabama. Melissa was born and raised in Illinois and attended Eastern Illinois University where she graduated with a Bachelor’s in Zoology. After graduation, she planned to move as close to the ocean as possible and landed an internship in Monterey, California (aka paradise) for marine mammal research. After working in research, she decided she wanted a career working hands-on with animals and looked to the veterinary industry and started working at a veterinary hospital in Carmel, California. She worked as a Kennel attendant, receptionist and was promoted to a veterinary assistant when a mentor encouraged her to return to school obtain her veterinary technician license. 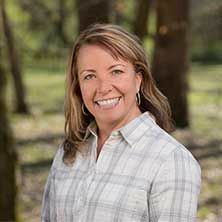 Melissa attended Hartnell College and received an Associate Degree in Animal Health Technology and received her Registered Veterinary Technician (RVT) license. Melissa then moved to a large veterinary hospital in Las Vegas and was promoted to Assistant Manager before working in Animal Control. She then joined a national veterinary company where she realized how much she enjoyed managing people and became a Field Director for more than 3 years before joining the SVP family in 2018. She recently moved from Las Vegas to Birmingham and couldn't be more excited to explore the southeastern part of the United States with her husband (Kevin), 9-year-old son (Jackson), 30-year-old daughter (Jenniffer), and dog (Annie). She enjoys running, reading, hiking, music, anything at the ocean, traveling, and spending time with family. They plan to adopt another dog once we get settled in Alabama. What do you enjoy most about working at SVP? "My favorite part of SVP is the culture. Being veterinarian-led, it keeps us grounded and with our true focus - pets. I love the fact the teams have fun and work hard to be successful aka work hard and play hard!"